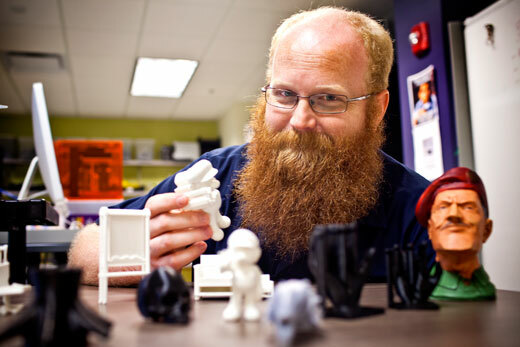 Robin Horton, director of Emory’s TechLab, holds a model created by the one of the lab’s 3-D printers. Objects for a variety of projects for learning and demonstrating from Emory College, School of Medicine, Goizueta Business School and more have been “printed” at the lab. In the computing center on the second floor of Cox Hall, what some people might consider “magic” is going on. In this space where students study, work, surf, and game, sounds coming from a room off to the side of the main open space are reminiscent of the noisy daisy wheel printers of the ‘70s and ‘80s. Printing, yes. But with a 21st century twist: These are 3-D printers, one of which is at work producing a phone holder for a bike. “We have officially been open since January of this year as part of Student Digital Life, which is part of Academic Technology Services, which is part of Libraries and Information Technology (LITS),” says Robin Horton, who runs the lab. “We’ve had about 200 people come through our door since January and that’s with no advertising, purely word of mouth, and we had about 75 projects requested,” he says. Right now the services are free. But “by fall, we’re hoping to have a price settled in place,” Horton says. Three printers extrude the soft but solid plastic — “like frosting on a cupcake” — to create objects, building them up from the bottom layer to the top. As the plastic cools, the printer works on the next layer. The fourth printer uses a liquid resin with a laser to quickly cure items that turn out with smoother surfaces and greater detail. Across from the printers is a table holding examples of what the machines can do — a curled up pig, a futuristic-looking version of the Eiffel Tower, an attic lion from the Michael C. Carlos Museum, small helmets and more. Elishuwon Mitchell, a junior majoring in computer science and minoring in physics, explains that the printers are hooked to a computer with programs that offer a seemingly infinite variety of objects to be printed — from castles to horses to unspecific designs. To make the lab and its services known, “we have quietly been soliciting faculty who teach various things to come up with ways to utilize this as a service,” says Horton. “For example, there is a business school professor who wanted to use us as an option for his students to come and work on a final project and print it off, because he was teaching about ‘The Internet of Things,’ maker culture and new and emerging technologies,” he says. One early client was art history graduate student Alison Hight, who studies Greek archeology and architecture. “3-D modeling and printing is becoming very popular within the field, and I am interested in using these skills to advance my work as an architectural historian,” says Hight, noting that she is currently in the middle of a one-year leave to pursue increasing her technical and 3-D modeling skills. Hight is currently working with Carlos Museum conservator Kathryn Etre to reconstruct a classical cup. Explains Etre, “Alison has been helping me to reconstruct missing elements of a kylix or footed cup. It is signed by the potter Euphronios, who was active in the late 6th - early 5th century BC. The cup is one of a few in the world signed by Euphronios." “Unfortunately, we only have approximately a third of this object and none of the sherds join to create a complete profile of the cup," Etre says. "This highly fragmentary nature of the ceramic made creating the missing areas difficult by traditional methods. 3-D scanning, digital re-creation of the missing areas, and 3-D printing is an elegant solution to this treatment, allowing for fine adjustments to the recreated profile and reducing the amount of refining necessary with traditional treatment methods." Another user early user is Bharath Shankar, a rising junior studying neuroscience and behavioral biology. When Shankar learned of the 3-D printing lab, "I was working on plans to create a Daft Punk helmet replica. Daft Punk is my favorite musical group, and I wished to use this helmet as a cool costume for various occasions,” he says. “3-D printing is the most efficient method for creating things like these . . . I managed to find a suitable 3-D model online and brought it to Robin. He showed me the processes that they go through in printing things there, and we started to print out the parts for it. I am still printing out the over 40 parts of this helmet." Shankar became so intrigued by the process that he decided to apply for a job in the lab, where he will begin working in the fall semester. Projects related to anatomy and biology are among the most common for the 3-D printing lab, Horton says. “A lot of the neuroscience students have been through here, printing neurons and full brains and things of that nature,” he says. The lab has also printed an image of Leonardo Da Vinci’s Vitruvian man for Ted Pettus, an assistant professor in the department of cell biology who works with the Emory-Tibet Medical Initiative; models to help recreate MRIs; and projects from biovisualist Michael Konomos. “We conducted several successful tests of the printer for medical applications including the Belatacept molecule, an immunosuppressant that School of Medicine Dean Chris Larsen developed,” says Konomos. Satyen Tripathi, senior multimedia developer for the department of surgery, printed an anatomically correct kidney model with the internal anatomy visible. The facility has been dubbed TechLab, and indeed the lab’s purpose is broader than 3-D printing, Horton says. “The purpose of this space initially was to bring in new technology and see how we can apply it to academic life — whether it's a new kind of smart board, 3-D scanning, 3-D printing or some other technology. “We’re building an evaluation process so we can look at a new service and apply a recommendation of whether we as Student Digital Life feel it’s viable or can be applied somewhere," he notes. He keeps user stats per school, which show that most projects are coming from Emory College of Arts and Sciences. This summer, the lab has expanded into a larger space to keep up with demand. “3-D printing has been around for years, since the ‘80s, but is just now becoming affordable for small or personal business or individuals,” Horton says. “It’s still a magical thing for a lot of people. But it’s not until you work with it that you learn just how frustrating it can be and how much effort is involved — and how it may not be the tool for you. Getting that practical experience gives you a better appreciation for the production time, effort, the costs involved or just the general headaches.